The first story relates about the big seashell vernacularly known as “Budyong” that is used to assembly people in the earlier time as it produced a loud sound once its peak is blown. Before the place was lived by the people considered as the early settlers, it was believed to have been inhabited already with uncivilized people called “loog“. As these considered early settlers (labeled then as new comers) lived in, the loogs stole the former’s properties such as carabao/s, horses, and other animals and products hence, the new comers abhor the loogs. They group altogether and with the use of Budyong, they succeeded in driving away the loogs as every time the latter were seen, the former will keep on blowing the Budyong. From that time on, the place was called Odiong, due to the word Budyong, the big seashell that was used to cast the loogs away. The other story from the old folks of the place recounted the events that took place at he time when the Spaniards campaigned to bring the uncivilized people to the church. The story then was that; there was a group of Spanish soldiers sent to the place, which was at that time a wilderness. As they arrived at the putskirts of the place, they encounter the uncivilized people who did behind the big trees. The leader of the Spanish soldier was tagged right at his heart with an arrow called in the loal dialect as “odiong” ; hence the place was called Odiong. Another version on how the barangay got its name happened during the Spanish times at the height of Dagohoy Rebellion. It is surprising to know that Dagohoy who (lead the longest revolution in the nation history) hails somewhere in either Balilihan or Inabanga was able to reach Odiong together with his troops. One of the pioneers of the said place, Evaristo Madriñan, was appointed as the Commander of his fellow Insurrectus. In the claims said, it was in Odiong that Dagohoy and his troops had a meeting. The purpose of which is to attack tha Jagna Convent where the Spanish soldiers were stationed. When the plan was discovered, the Spanish High Command ordered a search of the insurrectus and destruction their operation. So, early in the morning, the Spaniards riding with their horses traversed the hinterlands passing in what now are barangays of Tubod Monte and Can-ipol. 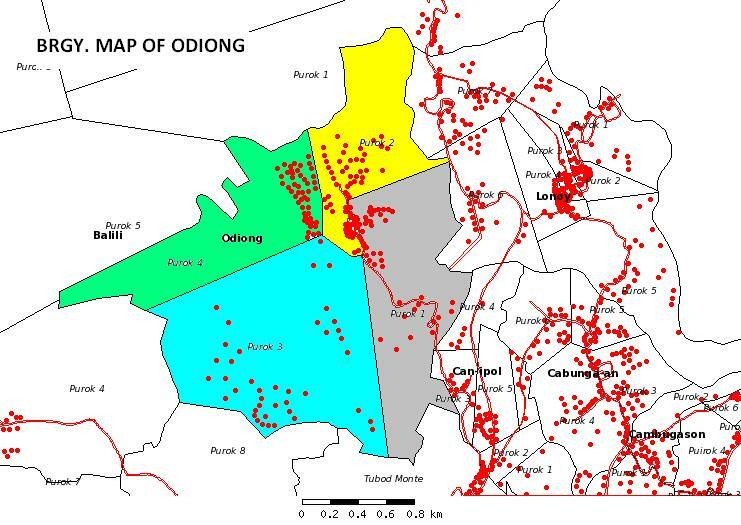 Ther target was the venue of Dagohoy’s meeting (Odiong) via Tinubdan in the northeat part. upon arriving at Tinubdan, the Spaniards stopped to eat their breakfast. Suddenly an avalance of numerous stones rolled down from Sagisinjin Hill overlooking Tinubdan followed by shot of poisonous arrows. The Captain of the Spaniards was the first one hit by an arrow on his neck. He ordered his men to retreat from the attack because the arrows were very deadly or “Udyong1 Malala2“. From that time on, the Spaniards called the place where the people with poisonous arrows came from as “Udyong Malala” and did not attempt to return anymore to the place because they were afraid of “taga3-Udyong Malala”. Later, the name was shortened and the spelling was change from Udyong (vernacularly mean gapasan sa pana) to Odiong. 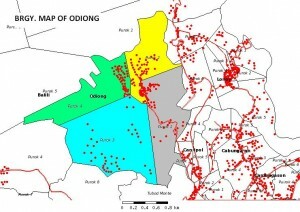 Odiong was established on or before the year 1850. The original families were Alipio galia, Isidro Nalasa, Onocentes Rañises and Lucio Ednilan (Virtudazo et al 1952). Brgy. Odiong shall be a peaceful, clean and progressive community with the environment that is kept at its best and the aspired projects are realized to the fullest because the people are faithful to God, enthusiastic and disciplined, intellectually and physically healthy, live in peace and harmony, understanding & Cooperation with one another and attained stability in living. The aspirations of Brgy. Odiong will be achieved through open communication to effect a concensus for the people’s benefit and the barangay’s improvement coordination of the constituents to the different agencies that can possibly help in realize the plans, hard work in cultivating crops that boast good health increasing livestock to augment income and in aiming higher level of education in both parent & children discipline in conserving natures gift the caves, the forest, the creeks and spring to create a clean, safe & sustainable environment & above all prayer to the Almighty God who is the source of strength to carry on our vision.